Delight in your own oceanfront playground at Casa Escondida. 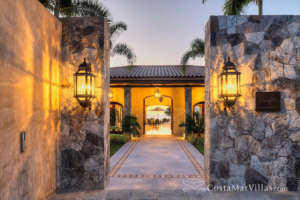 This breezy Punta Mita vacation rental is located in the exclusive Los Ranchos community and opens to your very own sandy beach. Invite up to ten friends or family members to join you at the villa’s resort-worthy outdoor living areas, spacious interiors and four suite-style bedrooms. 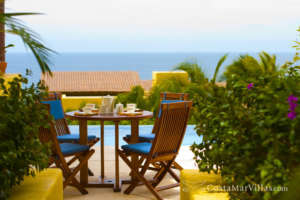 Your holiday at the casa includes the services of a chef and housekeeper, leaving you free to finish a beach read on a lounger by the infinity pool, sip a tropical cocktail beneath a palm tree in the garden or take a honeymoon-worthy stroll on the beach right in front of the house. As the sun sinks toward the ocean, heat up the barbecue for dinner at the al-fresco table, gather around the firepit or soak in the hot tub. The villa also has indoor amenities from an exercise room to TV and Wi-Fi. Mexico meets Morocco to stylish effect inside this luxury property. The stunning living areas are laid out around a central palapa-covered open-air sitting area, and even the indoor living and dining room opens to terraces on two sides. Stone floors, slipcovered furniture, natural-fiber rugs and a collection of intriguing objets d’art create a look that’s casual yet chic. Though chef service is included, the villa does have a fully equipped kitchen with a breakfast bar.